Thermapen is the ultimate BBQ thermometer. It’s fast. It’s sleek. It’s accurate. It’s now back-lit and has an auto-rotate feature. These guys have upgraded the classic Thermapen to include some really cool features. Check out our new video review of the new Thermapen Mk4 where we compare it to the classic Thermapen. When deciding whether to get the Mk4 vs the classic Thermapen, this video will help you weigh your options. 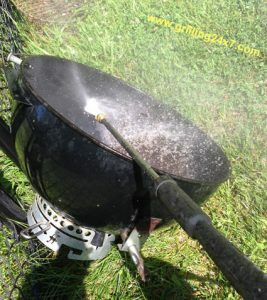 Mrs. Grilling24x7 even dunks the waterproof Mk4 into the ice bath to show you how waterproof this BBQ thermometer is! This link will send you over to Thermoworks for the Mk4. The Thermapen Classic can be seen here. You’ll notice I use both the Thermapen Mk4 and the classic Thermapen all throughout this blog. 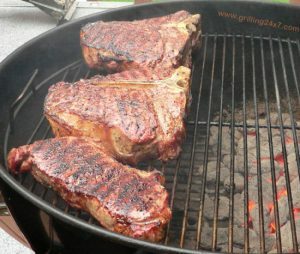 I love my Thermapens and I wouldn’t be able to pull off great grilled meals without them. Recording an accurate temperature, for example, is the difference between serving dry pork vs. juicy tender pork. Some low quality thermometers can be off by as much as 10-20 degrees so, using pork as an example, you might think you are at the perfect pork tenderloin serving temperature of 145 degrees F, when you are actually 165! That’s overcooked pork tenderloin. Stuff like that doesn’t happen with the Thermapens. 145 is 145 degrees. The Thermapen is the ultimate grilling thermometer. It fits in your pocket so you can keep it with you all the time. Most importantly, it is accurate. Not to mention it is fast. Really fast. That means that when you stick this thing into some meat it reads the correct temperature almost instantaneously. The cheaper thermometers you find in the grocery store will read the temperature in about 25 seconds. These read it in 2-3 seconds. Anyone who knows BBQ will be using a Thermapen. Have you heard of the new Thermoworks Smoke? 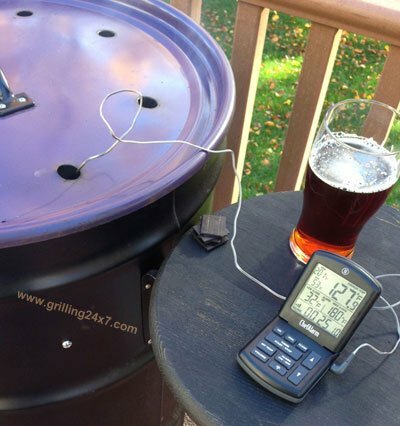 Check out my 2016 review of the new Thermoworks Smoke, the new wireless dual channel BBQ thermometer. The makers of Thermapen also came up with a really nice Chef Alarm thermometer which contains a count down/up timer as well as a high quality thermometer with high and low temperature alarms. This one is made just right for monitoring your long BBQ smokes. Again, I can’t recommend these products enough. Totally high quality products here. This is a great option if the original Thermapen is out of your price range. You can get a Thermoworks Chef Alarm for about $60. The Thermoworks ThermaQ has to be the fanciest thermometer I’ve ever seen. The Thermapen is sweet but if you want to take it to a whole new level check out the ThermaQ. ThermaQ reads two temperatures at once from professional Type K Thermocouple probes. Designed for competition BBQ teams and chef-level Sous Vide cooking, the ThermaQ provides settable high and low alarms for both channels. ThermaQ’s large backlit display delivers the right temperature info without having to push confusing buttons and with none of the useless fluff found in houseware products. No flashing pigs, cows or chickens. Just really useful temperatures. The minimum and maximum temps for both channels are constantly shown for instant recollection of your start temperature and the peaks when you weren’t looking. Clear them anytime and use them to track the stability of your cooker. Use the high alarm setting to alert you to food doneness or to an overheating cooker. Set the low alarm (it sounds on the way down) to alert you when something has cooled to a target. Use both low and high to help you control a narrow heating band when you’re doing a long cook. Use couldn’t be simpler. Just 4 buttons. The smart display prompts you through each setting. The instrumentation-grade circuit delivers the highest accuracy available to professional users. Built in the same factory as our world-leading Thermapen, ThermaQ is built for commercial use. Splashproof and rugged, it’s designed for industrial environments and streamlined for use by busy chefs with demanding requirements. 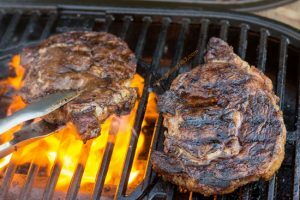 Can You Grill A Steak On A Small Tailgate Grill?